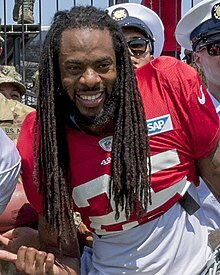 Richard Kevin Sherman (born March 30, 1988) is an American football cornerback for the San Francisco 49ers of the National Football League (NFL). He was drafted by the Seattle Seahawks in the fifth round of the 2011 NFL Draft. He has been selected to the Pro Bowl four times and voted All-Pro four times, including three times to the first team. He led the NFL in interceptions in 2013, when he also helped the Seahawks win their first Super Bowl. Sherman played college football for the Stanford Cardinal, beginning his career as a wide receiver before moving to cornerback as a junior. He was drafted by the Seahawks in the fifth round of the 2011 NFL Draft. Since entering the league, he has the most interceptions and defended passes of any active player. 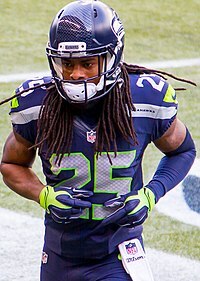 During his time as a member of the Seahawks, Sherman was part of the "Legion of Boom", the Seahawks' starting secondary which contributed to Seattle having the best pass defense in the NFL in 2013. This unit helped the Seahawks win Super Bowl XLVIII; their 43–8 win over the Denver Broncos matched the third-largest margin of victory in the history of the Super Bowl. The Seahawks made it to Super Bowl XLIX the following season losing in a close game against the New England Patriots. During his time with the Seahawks they led the league in scoring defense four years straight between 2012-2015, making them the first team to do so since the 1950s Cleveland Browns. Sherman was born in Compton, California, where he attended Dominguez High School, starring in football and track and field. As a senior in 2005, he accounted for 1,030 all-purpose yards, including 870 yards on 28 catches and three punt returns for touchdowns. He also recorded 45 tackles, eight pass breakups and one interception as a defensive back, and helped Dominguez to a CIF Southern Section Division III title with a 41–14 victory over Sherman Oaks Notre Dame High School in the championship game. He graduated from Dominguez High School in 2006, where his classmates voted him the "Male student most likely to succeed." A scholar-athlete, he was salutatorian (ranked second) in his high school class. He graduated high school with a 4.2 GPA. As a member of the school's track team, Sherman was named a USA Today All-American after winning the California state title in the triple jump, with a mark of 15.44 meters, and was the 7th ranked triple jumper in California in 2005. He made it to the finals of the state meet in the 110-meter hurdles, placing third with a time of 13.99 seconds, and also finished sixth in the long jump, with a mark of 7.25 meters. He was also timed at 10.77 seconds in the 100 meters. "2006 Stanford Football Recruiting Commits". Scout.com. Sherman received an athletic scholarship to attend Stanford University, where he played for the Stanford Cardinal football team from 2006 to 2010. He began his career at Stanford as a wide receiver and led the Cardinal in receiving as a freshman in 2006 while being named a Freshman All-American. In the 2006 season, he had 34 receptions for 581 receiving yards and three receiving touchdowns. He caught 47 passes over the next two years before suffering a season-ending knee injury after playing in the first four games in 2008, which became a redshirt year. He was granted his request to switch to cornerback after his injury and made 112 tackles over his final two years, with six interceptions. He was part of the 2010 Stanford Cardinal team that finished 12–1, a school record. Sherman is a member of Phi Beta Sigma fraternity and graduated from Stanford University in 2010 with an undergraduate degree in communication. He began work towards his master's degree when he returned for a fifth year during his final year of eligibility. On January 29, 2011, Sherman played in the 2011 Senior Bowl and deflected two passes as part of Marvin Lewis' North team that lost 24-10 to the South. Sherman was added as a late replacement after Curtis Marsh Jr. sustained a hamstring injury on the first day of practice. His Senior Bowl performance was well received and was expected to raise his draft stock. Sherman attended the NFL Scouting Combine and completed all of the combine and positional drills. On March 17, 2011, Sherman participated at Stanford's pro day and attempted to improve on his combine performance. He performed the 40-yard dash (4.28s), 20-yard dash (2.56s), 10-yard dash (1.58s), vertical jump (37"), broad jump (11'0"), short shuttle (4.29s), and three-cone drill (6.72s). At the conclusion of the pre-draft process, Sherman was projected to be selected anywhere from the fourth to sixth rounds by the majority of NFL draft experts and scouts. The Sporting News projected Sherman to be a second round pick and Fox Sports' Peter Schrager projected Sherman to be a fifth round pick. He was ranked as the fourth best cornerback in the draft by The Sporting News, was ranked the 22nd best cornerback by USA Today, was ranked the 24th cornerback prospect by DraftScout.com, and was ranked the 30th best cornerback by Pro Football Weekly. The Seattle Seahawks selected Sherman in the fifth round (154th overall) of the 2011 NFL Draft. Sherman was the 25th cornerback drafted in 2011. While watching the draft with his family at home, Sherman was "livid" about players he perceived as inferior players were getting drafted before him. On July 22, 2011, the Seattle Seahawks signed Sherman to a four-year, $2.22 million contract that includes a signing bonus of $182,424. 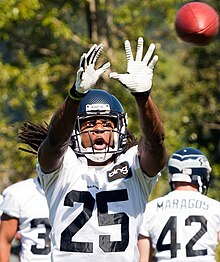 Throughout training camp, Sherman competed to be a starting cornerback against Walter Thurmond, Kelly Jennings, Byron Maxwell, Brandon Browner, and Kennard Cox. Head coach Pete Carroll named Sherman the fourth cornerback on the depth chart to begin the regular season, behind Marcus Trufant, Brandon Browner, and Walter Thurmond. He made his professional regular season debut in the Seattle Seahawks' season-opening 33–17 loss at the San Francisco 49ers. In Week 4, Sherman made his first career solo tackle during a 13-yard punt return by wide receiver Eric Weeks as the Seahawks lost 30–28 to the Atlanta Falcons. On October 30, 2011, Sherman earned his first career start after Marcus Trufant and Walter Thurmond were both placed on injured reserve for the remainder of the season. He finished the Seahawks' 34–12 loss to the Cincinnati Bengals with five combined tackles, a season-high three pass deflections, and made his first career interception. He made his first career interception off a pass by quarterback Andy Dalton, that was originally intended for wide receiver A. J. Green, in the third quarter. In Week 12, he collected a season-high seven combined tackles, a pass deflection, and intercepted a pass by Rex Grossman during a 23–17 loss to the Washington Redskins. On January 1, 2012, Sherman recorded a season-high thirty solo tackles, a pass deflection, and an interception in the Seahawks' 23–20 loss at the Arizona Cardinals in Week 17. Sherman intercepted a pass by Cardinals' quarterback John Skelton, that was initially intended for wide receiver Andre Roberts, and returned it for a 33-yard gain in the fourth quarter. Sherman finished his rookie season in 2011 with 55 combined tackles (47 solo), 14 pass deflections, four interceptions, and a forced fumble in 16 games and ten starts. Sherman was selected to the 2011 PFW All-Rookie Team and led all rookies with 17 pass deflections and four interceptions. Pro Football Focus gave Sherman an overall grade of 85.2, which ranked 16th among all qualifying cornerbacks in 2011. Sherman entered training camp slated as the starting cornerback, but saw minor competition from Marcus Trufant. Head coach Pete Carroll named Sherman and Brandon Browner the starting cornerbacks to begin the regular season. He started in the Seattle Seahawks' season-opener at the Arizona Cardinals and made four solo tackles, two pass deflections, and intercepted a pass by John Skelton in their 20–16 loss. On October 14, 2012, Sherman made three solo tackles, three pass deflections, and an interception during a 24–23 win against the New England Patriots. After the game, Sherman taunted quarterback Tom Brady and posted a photo of himself yelling at Brady with "U mad bro?" superimposed on it on his Twitter account. He later removed the post. Prior to Week 8 against Detroit, Sherman nicknamed himself Optimus Prime, an action intended to send out the message that he would shut down Detroit's wide receiver, Calvin Johnson, known by his nickname Megatron. He collected a season-high eight combined tackles and held Calvin Johnson to three catches for 46-yards as the Seahawks lost 28–24 at the Detroit Lions. On November 11, 2012, Sherman recorded three combined tackles, three pass deflections, an interception, and made his first career sack during a 28–7 win against the New York Jets. Sherman sacked quarterback Mark Sanchez and forced a fumble that was recovered by teammate Jason Jones in the fourth quarter. On November 25, 2012, it was reported that Sherman and teammate Brandon Browner were both facing four-game suspensions after they were accused of taking Adderall which violated the league's policy against performance-enhancing substances. On December 9, 2012, Sherman recorded two combined tackles, deflected three passes, recovered a fumble, made two interceptions, and returned an interception for his first career touchdown during the Seahawks' 58–0 victory against the Arizona Cardinals. Sherman intercepted a pass by quarterback John Skelton, that was originally intended for wide receiver Larry Fitzgerald, and returned it for a 19-yard touchdown in the second quarter. In Week 16, Sherman made five combined tackles, a season-high four pass deflections, and intercepted a pass by quarterback Colin Kaepernick during a 42–13 victory against the San Francisco 49ers. During the second quarter, Sherman recovered a blocked field goal and returned it for a 90-yard touchdown after teammate Red Bryant blocked a 21-yard field goal attempt by 49ers' kicker David Akers. On December 27, 2012, it was announced that Sherman won his appeal of a four-game suspension for violating the league's performance-enhancing drug policy. Sherman had intentions to sue the league if the suspension was upheld. He started all 16 games in 2012 and made 64 combined tackles (53 solo), a career-high 24 pass deflections, eight interceptions, a touchdown, and a sack. He received an overall grade of 94.3 from Pro Football Focus in 2012. The Seattle Seahawks finished second in the NFC West with an 11-5 record and earned a playoff berth. On January 6, 2013, Sherman started in his first career playoff game as the Seahawks defeated the Washington Redskins 24-14 in the NFC Wildcard Game. The following week, he made three pass deflections as the Seahawks were eliminated from the playoffs following a 30-28 loss at the Atlanta Falcons in the NFC Divisional Round. Sherman and Brandon Browner returned as the starting cornerbacks alongside safeties Earl Thomas and Kam Chancellor. On September 29, 2013, Sherman made four solo tackles, two pass deflections, and returned an interception for a touchdown as the Seahawks' defeated the Houston Texans 23–20 in a comeback victory. Sherman intercepted a pass by quarterback Matt Schaub, that was intended for tight end Owen Daniels, and returned it for a 58-yard touchdown in the fourth quarter to tie the game 20–20 which sent it into overtime. In Week 15, he made two combined tackles, a season-high three pass deflections, and intercepted two passes by quarterback Eli Manning in a 23–0 win at the New York Giants. The following week, he recorded a season-high eight combined tackles, deflected two passes, and intercepted two passes by quarterback Carson Palmer during a 17–10 loss to the Arizona Cardinals in Week 16. On December 27, 2013, it was announced that Sherman was voted to the 2014 Pro Bowl, marking the first Pro Bowl selection of his career. He finished the season with 48 combined tackles (38 solo), 16 pass deflections, eight interceptions, and a touchdown in 16 games and 16 starts. He was voted to the Associated Press NFL All-Pro First Team for the second consecutive season. Sherman received an overall grade of 87.8 from Pro Football Focus in 2013. The Legion of Boom allowed the fewest passing yards in the league and the Seahawks had the top ranked defense in 2013. The Seattle Seahawks finished first in the NFC West with a 13–3 record and earned a first round bye. The Seahawks reached the NFC Championship after defeating the New Orleans Saints 23–15 in the NFC Divisional Round. On January 19, 2014, Sherman made two combined tackles and a pass deflection as the Seahawks defeated the San Francisco 49ers 23–17 in the NFC Championship Game. He played a critical role and deflected a pass by quarterback Colin Kaepernick, that was intended for Michael Crabtree, which was caught by teammate Malcolm Smith to seal the Seahawks' 23–17 victory. The play was later dubbed "the Immaculate Deflection" (as an homage to the Immaculate Reception), and would later be voted by Seahawks fans to be the most significant play in franchise history. After the play, Sherman ran over to Crabtree and mockingly offered a handshake with Crabtree responding by shoving Sherman in his facemask. Sherman proceeded to make a choke sign towards Kaepernick and was immediately penalized by the officials for unsportsmanlike conduct. The NFL went on to fine Sherman $7,875 for his taunting directed towards Kaepernick. Well, I'm the best corner in the game! When you try me with a sorry receiver like Crabtree, that's the result you gonna get! Don't you ever talk about me! Don't you open your mouth about the best, or y'know I'm gonna shut it for you real quick! L.O.B.! Sherman's rant was the subject of scrutiny by fans and the media, some of whom deemed him a "thug". He later blamed Crabtree's shove for fueling his post-game rant, though he also said he regretted his attack and was dismayed by the negative response from the public. In response to the word "thug" being widely used to criticize Sherman following the incident, Sherman said "The reason it bothers me is because it seems like it's an accepted way of calling somebody the N-word now." On February 2, 2014, Sherman started in Super Bowl XLVIII and made three combined tackles and a pass deflection as the Seahawks defeated the Denver Broncos 43–8. He held wide receiver Eric Decker to one reception for a total of six-yards during the game. On May 7, 2014, the Seattle Seahawks signed Sherman to a four-year, $56 million contract extension with $40 million guaranteed and a signing bonus of $11 million. The agreement made him the highest paid cornerback in league history. On June 6, 2014, Sherman was announced as the cover athlete for Madden 15. Defensive coordinator Dan Quinn retained Sherman as the Seahawks' No. 1 starting cornerback alongside Byron Maxwell. In Week 6, he collected a season-high eight combined tackles during a 30–23 loss to the Dallas Cowboys. 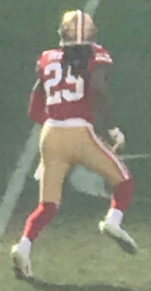 On November 27, 2014, Sherman made two solo tackles, two pass deflections, and intercepted two passes by Colin Kaepernick during the Seahawks' 19–3 win at San Francisco during the Thanksgiving Day game. His performance earned him the NFC Defensive Player of Week award. Sherman started all 16 games in 2014 and made 57 combined tackles (45 solo), eight passes defensed, and four interceptions. Pro Football Focus gave Sherman an overall grade of 89.9 in 2014. The Seattle Seahawks finished first in the NFC West with a 12–4 record and earned the No. 1 seed in the NFC. On January 10, 2015, Sherman recorded three combined tackles, two pass deflections, and an interception during the Seahawks' 31–17 victory against the Carolina Panthers in the NFC Divisional Round. The following week, Sherman made four combined tackles, a pass deflection, and an interception during a 28–22 victory against the Green Bay Packers in the NFC Championship Game. On February 1, 2015, Sherman started in Super Bowl XLIX and made three combined tackles as the Seahawks lost 28–24 to the New England Patriots. The following day, it was announced that Sherman would need Tommy John surgery to repair a torn ligament in his left elbow. Following the conclusion of the NFL season, the Pro Football Writers Association selected Sherman to win the PFWA Good Guy Award for his willingness to work with and provide insightful information to the media. He was the second consecutive Seahawk to win the award, as quarterback Russell Wilson was the previous recipient. Sherman was also awarded NFC Defensive Player of the Year honors by the Kansas City Committee. Sherman with the Seahawks in 2015. The Seattle Seahawks' new defensive coordinator Kris Richard retained Sherman as the No. 1 starting cornerback on the depth chart in 2015, along with Cary Williams. Sherman was voted to the 2016 Pro Bowl, marking his third consecutive selection. He started all 16 games in 2015 and recorded 50 combined tackles (33 solo), 14 pass deflections, and two interceptions. Pro Football Focus gave Sherman an overall grade of 86.7 in 2015. The Seattle Seahawks finished second in the NFC West with a 10-6 record and earned a wildcard berth. They reached the NFC Divisional round before losing 31-24 at the Carolina Panthers. He was named second-team All-Pro and was ranked 20th by his fellow players on the NFL Top 100 Players of 2016. Head coach Pete Carroll named Sherman and Jeremy Lane the starting cornerbacks to begin the regular season. On October 2, 2016, Sherman recorded five combined tackles, deflected two passes, and intercepted two passes by Jets' quarterback Ryan Fitzpatrick during a 27–17 victory at the New York Jets. In Week 8, he collected a season-high eight combined tackles during a 25–20 loss at the New Orleans Saints. On December 20, 2016, Sherman was voted to the 2017 Pro Bowl. He started all 16 games in 2016 and made 58 combined tackles (38 solo), 13 pass deflections, and four interceptions. He was also ranked 21st by his peers on the NFL Top 100 Players of 2017. Pro Football Focus gave Sherman an overall grade of 84.6, which ranked 13th among all qualifying cornerbacks in 2016. After the season, it was revealed that Sherman was battling a sprained MCL in his right knee, an injury that hampered him during the second half of the year. The Seahawks were suspected to have failed to disclose this injury, which prompted the NFL to investigate. If the injury was not disclosed in time, the Seahawks could have faced a heavy fine as well as a forfeiting a second-round pick in the 2017 Draft. Ultimately, the Seahawks were not penalized. Sherman and Jeremy Lane returned as the starting cornerbacks for the Seahawks in 2017. Sherman was bothered in 2017 by his Achilles, which he initially injured in Week 5 during a 16–10 win against the Los Angeles Rams. In the following weeks, he tried to avoid making any severe cuts. On October 29, 2017, Sherman made four combined tackles, two pass deflections, and intercepted two passes by quarterback Deshaun Watson during a 41–38 victory against the Houston Texans. During Week 10 in a 22–16 win at Arizona, he left the game in the third quarter after rupturing his Achilles, and was ruled out for the season. He finished the season with 35 combined tackles (25 solo), seven pass deflections, and two interceptions in ten games and ten starts. His injury ended his streak of 106 consecutive game appearances and 100 consecutive starts. Sherman received an overall grade of 82.7 from Pro Football Focus, which ranked 33rd among all qualifying cornerbacks in 2017. Despite only playing nine games, he was ranked 64th by his peers on the NFL Top 100 Players of 2018. On March 7, 2018, it was reported that Sherman did not expect to return to the Seahawks for the 2018 season, and that he had spent the previous day telling his teammates goodbye. He was officially released on March 9, 2018. On March 10, 2018, just a day after being released by the Seahawks, Sherman agreed to a three-year, $39 million contract with the San Francisco 49ers. During Week 16 against the Chicago Bears, Sherman was disqualified after throwing punches at wide receivers Josh Bellamy and Anthony Miller, who were also ejected. The incident triggered after Marcell Harris made a late hit on Mitchell Trubisky. On December 29, Sherman was fined $10,026. The following regular season stats were retrieved from NFL.com. On February 5, 2015, four days after Super Bowl XLIX, Sherman's girlfriend Ashley Moss gave birth to their first son, Rayden Sherman. Moss and Sherman were engaged in June 2015. The couple welcomed their second child, daughter Avery, on April 16, 2016. Sherman and Moss were married on March 28, 2018. Sherman's outspoken personality, tendency for making big plays, and his frequent trash-talk have seen him become one of the NFL's most well known players. His trash-talking personality is what has brought him into the spotlight. In January 2014, he garnered national attention with a post-game interview made immediately after his tipped pass ensured the Seahawks a victory over the San Francisco 49ers in the 2013 NFC Championship game, in which he labeled himself the "best corner in the game" and called San Francisco wide receiver Michael Crabtree, to whom the decisive pass had been thrown, a "sorry" receiver. Sherman was featured on the cover of Madden NFL 15. Sherman also actively writes for The Players' Tribune. Sherman has his own charity called Blanket Coverage – The Richard Sherman Family Foundation. In 2013, Sherman started his charity to help kids in low-income communities by providing them with school supplies and clothing. His foundation was formed to help kids across the country achieve academic success. Sherman is interested in cryptocurrency and tech stocks and is also an ambassador for COBINHOOD, a zero trading fee cryptocurrency exchange, and for the trivia app FleetWit. Sherman owns homes in Yorba Linda, California and Maple Valley, Washington. ^ a b Gil Alcaraz IV (January 27, 2011). "An insider's view with Stanford cornerback Richard Sherman". Yahoo! Sports. Archived from the original on October 25, 2012. Retrieved December 27, 2012. ^ Erik Matuszewski (February 3, 2014). "Seahawks Win First Super Bowl Title With 43-8 Rout of Broncos". Bloomberg. ^ Farmer, Sam. "Seattle Seahawks' Richard Sherman is a hit at Compton alma mater". Los Angeles Times. Retrieved March 31, 2018. ^ a b Shpigel, Ben. "Seahawks' Richard Sherman Is Much More Than Just Talk". The New York Times. Retrieved December 18, 2014. ^ Tommy Tomlinson (January 19, 2014). "22 Brief Thoughts About That Richard Sherman Interview". Forbes. ^ "Player Bio: Richard Sherman". GoStanford.com. September 19, 2009. Retrieved January 24, 2014. ^ "Chasing his brother led Richard Sherman to a state track title". ^ "Seahawks duo Sherman and Johnson were fierce Dominguez High teammates". MaxPreps.com. ^ "Richard Sherman College Stats". College Football at Sports-Reference.com. Retrieved March 31, 2018. ^ "Richard Sherman 2006 Game Log". College Football at Sports-Reference.com. Retrieved March 31, 2018. ^ "Richard Sherman 2007 Game Log". College Football at Sports-Reference.com. Retrieved March 31, 2018. ^ "Richard Sherman 2008 Game Log". College Football at Sports-Reference.com. Retrieved March 31, 2018. ^ "Richard Sherman 2009 Game Log". College Football at Sports-Reference.com. Retrieved March 31, 2018. ^ "Richard Sherman 2010 Game Log". College Football at Sports-Reference.com. Retrieved March 31, 2018. ^ Withers, Bud (July 28, 2013). "David Shaw adds to the legend of Richard Sherman". The Seattle Times. Archived from the original on January 28, 2018. ^ "Stanford Cardinal Football Record By Year". College Football at Sports-Reference.com. Retrieved March 31, 2018. ^ Phipps-Smith, DeMario. "Richard Sherman: Athletes need to speak out on social issues". Chicago Sun-Times. Retrieved November 14, 2016. ^ Mason Sr., Jonathan A. "Brother's Keepers: Phi Beta Sigma Fraternity's legacy has left an indelible mark on society". Atlanta Journal Constitution. Retrieved November 14, 2016. ^ Shpigel, Ben. "Seahawks' Richard Sherman Is Much More Than Just Talk". The New York Times. Retrieved November 14, 2016. ^ Eric Sondheimer (June 21, 2010). "Football: Richard Sherman graduates from Stanford". Los Angeles Times. Retrieved December 27, 2012. ^ "Senior Bowl notebook: Challenge part of Bills coach Chan Gailey's plan". AL.com. January 25, 2011. Retrieved July 23, 2018. ^ Allen, Scott (January 31, 2011). "Card Clicks: Richard Sherman Makes Most of Senior Bowl Invite". ruleoftree.com. Retrieved July 23, 2018. ^ Kerr, Drew (February 1, 2011). "2011 Senior Bowl Box Score, Recap, Results: The Players That Did, And The Players That Didn't". ninersnation.com. Retrieved July 23, 2018. ^ Allen, Scott (April 27, 2011). "2011 NFL Draft Projections: Richard Sherman". ruleoftree.com. Retrieved July 23, 2018. ^ Lande, Russ (April 14, 2011). "NFL Final Mock Draft: Round 2". sportingnews.com. Retrieved July 23, 2018. ^ Kadar, Dan (January 30, 2014). "Richard Sherman found stardom after being lightly regarded in the NFL Draft". sbnation.com. Retrieved July 23, 2018. ^ "NFL Draft Analysis: Cornerbacks". SportingNews.com. Retrieved July 23, 2018. ^ "Richard Sherman, DS #24 CB, Stanford". Draftscout.com. Retrieved July 23, 2018. ^ "2011 NFL Draft Listing". Pro-Football-Reference.com. Retrieved March 31, 2018. ^ "These 24 cornerbacks were taken before Richard Sherman in the 2011 NFL Draft". FoxSports.com. Retrieved July 23, 2018. ^ Michael Silver (December 11, 2012). "Seahawks' Richard Sherman wants to 'destroy' the NFL and become the best CB of all time". Yahoo! Sports. Retrieved March 8, 2013. ^ "Overthecap.com: Richard Sherman contract". overthecap.com. Retrieved July 23, 2018. ^ "Spotrac.com: Richard Sherman contract". spotrac.com. Retrieved July 23, 2018. ^ Tadoro, Charlie (August 10, 2011). "Seattle Seahawks 2011 Preseason Schedule: Position Battle Preview". BleacherReport.com. Retrieved July 23, 2018. ^ "Ourlads.com: Seattle Seahawks Depth Chart: 09/04/2011". Ourlads.com. Retrieved July 23, 2018. ^ "NFL Game Center: Week 4-2011: Atlanta Falcons @ Seattle Seahawks". NFL.com. Retrieved July 23, 2018. ^ Katz, Michael (October 17, 2011). "Marcus Trufant Injury: Season Over For Seahawks CB". sbnation.com. Retrieved July 23, 2018. ^ Kunnath, Avinash (October 23, 2011). "Walter Thurmond Injury: Seahawks CB Cracks Fibula, Ending His Season". seattle.sbnation.com. Retrieved July 23, 2018. ^ "NFL Game Center: Week 8-2011: Cincinnati Bengals @ Seattle Seahawks". NFL.com. Retrieved July 23, 2018. ^ "NFL Game Center: Week 12-2011: Washington Redskins @ Seattle Seahawks". NFL.com. Retrieved July 23, 2018. ^ "NFL Game Center: Week 17-2011: Seattle Seahawks @ Arizona Cardinals". NFL.com. Retrieved July 23, 2018. ^ a b c d "NFL Player stats: Richard Sherman (2011)". NFL.com. Retrieved July 23, 2018. ^ "All Rookie Team". Pro Football Weekly. January 18, 2012. Archived from the original on January 22, 2013. Retrieved December 27, 2012. ^ "2011 NFL Defense". Pro-Football-Reference.com. Retrieved March 31, 2018. ^ a b c d e "Pro Football Focus: Richard Sherman". ProFootballFocus.com. Retrieved July 25, 2018. ^ "Ourlads.com: Seattle Seahawks Depth Chart: 10/01/2012". Ourlads.com. Retrieved July 23, 2018. ^ a b Doug Farrar (October 15, 2012). "Richard Sherman beats Tom Brady; taunts the Pats with 'U MAD BRO?' after the game". Shutdown Corner. Yahoo! Sports. Retrieved December 27, 2012. ^ Nate Davis (October 25, 2012). "Megatron ready for Seahawks' Optimus Prime". Game On!. USA Today. Retrieved March 9, 2013. ^ "Calvin Johnson Game by Game Stats and Performance". ESPN. Retrieved January 9, 2013. ^ "Seattle Seahawks at Detroit Lions - October 28th, 2012". Pro-Football-Reference.com. Retrieved March 31, 2018. ^ "NFL Game Center: Week 10-2012: New York Jets @ Seattle Seahawks". NFL.com. Retrieved July 24, 2018. ^ "Richard Sherman, Brandon Browner face suspensions". NFL.com. November 25, 2012. Retrieved July 24, 2018. ^ "Watch Arizona Cardinals vs. Seattle Seahawks [12/09/2012)". NFL.com. Retrieved January 24, 2014. ^ "Arizona Cardinals at Seattle Seahawks - December 9th, 2012". Pro-Football-Reference.com. Retrieved March 31, 2018. ^ "Watch San Francisco 49ers vs. Seattle Seahawks [12/23/2012". NFL.com. Retrieved January 24, 2014. ^ "San Francisco 49ers at Seattle Seahawks - December 23rd, 2012". Pro-Football-Reference.com. Retrieved March 31, 2018. ^ Lindsay H. Jones (December 27, 2012). "Seahawks' Richard Sherman wins appeal of NFL suspension". USA Today. Retrieved December 27, 2012. ^ Curtis Crabtree (December 26, 2012). "Richard Sherman likely to sue league if suspended". NBC Sports. Pro Football Talk. Retrieved December 27, 2012. ^ "Ourlads.com: Seattle Seahawks Depth Chart: 09/05/2013". Ourlads.com. Retrieved July 24, 2018. ^ "NFL Game Center: Week 4-2013: Seattle Seahawks @ Houston Texans". NFL.com. Retrieved July 24, 2018. ^ "NFL Player stats: Richard Sherman (2013)". NFL.com. Retrieved July 24, 2018. ^ "2014 Pro Bowl: complete roster". NFL.com. Retrieved July 24, 2018. ^ Blount, Terry (January 4, 2014). "Three Seahawks make the All-Pro team". ESPN. ^ Pompei, Dan (January 17, 2014). "Seattle Seahawks' Legion of Boom Is Pure, Old-School Football at Its Finest". Bleacher Report. ^ "NFL Team Total Defense Statistics – 2013". ESPN. December 30, 2013. ^ "Seahawks CB Richard Sherman fined $7,875 for NFC title game taunting". CBSSports.com. ^ Chris Greenberg (January 20, 2014). "Richard Sherman's Rant May Have 'Scared Erin Andrews,' Definitely Bothered Some On Twitter (VIDEOS)". The Huffington Post. ^ "Richard Sherman stunned by reaction to his victory rant". CNN.com. November 14, 2011. Retrieved January 24, 2014. ^ a b c "Richard Sherman fined $7,875 for on-field celebration". NFL.com. ^ "Richard Sherman gives new meaning to cover corner". ^ "Fox's Erin Andrews On Richard Sherman's Post-Game Rant: 'Wish More Athletes Would Be Like That'". YouTube. ^ "Richard Sherman: 'Thug' is accepted way of calling someone N-word". CBSSports.com. ^ Rosenthal, Gregg (May 7, 2014). "Richard Sherman, Seahawks strike $56M extension". NFL.com. Retrieved July 24, 2018. ^ "Ourlads.com: Seattle Seahawks Depth Chart: 10/01/2014". Ourlads.com. Retrieved July 24, 2018. ^ "Seattle Seahawks at San Francisco 49ers - November 27th, 2014". Pro-Football-Reference.com. Retrieved March 31, 2018. ^ "2014 NFL Defense". Pro-Football-Reference.com. Retrieved March 31, 2018. ^ "2014 NFL Standings & Team Stats". Pro-Football-Reference.com. Retrieved March 31, 2018. ^ "Divisional Round - Carolina Panthers at Seattle Seahawks - January 10th, 2015". Pro-Football-Reference.com. Retrieved March 31, 2018. ^ "NFC Championship - Green Bay Packers at Seattle Seahawks - January 18th, 2015". Pro-Football-Reference.com. Retrieved March 31, 2018. ^ Blount, Terry (February 2, 2015). "Seattle Seahawks Cornerback Richard Sherman needs Tommy John surgery". ESPN. Retrieved February 2, 2015. ^ Blount, Terry (June 15, 2015). "Richard Sherman wins the Good Guy Award". ESPN. Retrieved July 21, 2015. ^ "Seattle Seahawks depth chart". 247Sports.com. September 9, 2015. Retrieved July 25, 2018. ^ "2016 Pro Bowl roster". NFL.com. Retrieved July 25, 2018. ^ "2015 NFL Defense". Pro-Football-Reference.com. Retrieved March 31, 2018. ^ "'Top 100 Players of 2016': No. 20 Richard Sherman". NFL.com. ^ Arthur, Kenneth (August 27, 2016). "Seahawks projected defense depth chart for 2016". fieldgulls.com. Retrieved July 25, 2018. ^ "NFL Game Center: Week 4-2016: Seattle Seahawks @ New York Jets". NFL.com. Retrieved July 25, 2018. ^ "2017 Pro Bowl roster". NFL.com. December 20, 2016. Retrieved July 25, 2018. ^ "2016 NFL Defense". Pro-Football-Reference.com. Retrieved March 31, 2018. ^ "'Top 100 Players of 2017': No. 21 Richard Sherman". NFL.com. ^ "Has Richard Sherman already seen his best days?". profootballfocus.com. May 3, 2017. Retrieved July 25, 2018. ^ Condotta, Bob. "Report: NFL looking into whether Seahawks broke rules regarding Richard Sherman injury". Seattle Times. Retrieved January 17, 2017. ^ "Ourlads.com: Seattle Seahawks Depth Chart: 10/01/2017". Ourlads.com. Retrieved July 25, 2018. ^ a b Lewis, Edward (November 9, 2017). "Richard Sherman ruptures Achilles, out for rest of 2017". NFL.com. Retrieved November 10, 2017. ^ Henderson, Brady (November 9, 2017). "Seahawks CB Richard Sherman out for season after rupturing Achilles". ESPN.com. Archived from the original on November 10, 2017. ^ "Houston Texans at Seattle Seahawks - October 29th, 2017". Pro-Football-Reference.com. Retrieved March 31, 2018. ^ Boyle, John (November 14, 2017). "Seahawks Make Roster Moves". Seahawks.com. ^ "Richard Sherman doesn't expect to play for 'Hawks". NFL.com. March 7, 2018. ^ Sessler, Marc (March 9, 2018). "Richard Sherman released by Seattle Seahawks". NFL.com. ^ Boyle, John (March 9, 2018). "Seahawks Release Richard Sherman, Cornerback Who Helped "Shape Our Culture And Define Success"". Seahawks.com. ^ Shook, Nick (March 10, 2018). "Richard Sherman joining 49ers on 3-year, $39M deal". NFL.com. ^ "Richard Sherman, two Bears WRs ejected after fight". NFL. Retrieved December 23, 2018. ^ "Richard Sherman". NFL.com. Retrieved December 27, 2012. ^ TEGNA. "Baby Boom! Richard Sherman is a daddy". ^ Larrabee, Kirk (June 29, 2015). "Seattle Seahawks CB Richard Sherman gets engaged". 247Sports.com. Retrieved April 21, 2016. ^ "Seahawks' Richard Sherman and fiancée welcome second child". April 25, 2016. ^ "Richard Sherman got married, showed off his dance moves even with Achilles injury". Niners Nation. Retrieved March 29, 2018. ^ "Seahawks CB Richard Sherman is on the cover of Sports Illustrated". Seattle Seahawks & NFL News. ^ "Richard Sherman on 'Madden' cover". 6abc Philadelphia. ^ Ben Eagle. "Richard Sherman calls out Michael Crabtree in all-time postgame interview". SI.com. Archived from the original on January 20, 2014. ^ "Richard Sherman on 'Madden 15' cover: 'I don't believe in curses'". CBSSports.com. ^ "Richard Sherman". The Player's Tribune. ^ a b Florio, Mike. "Richard Sherman launches "Blanket Coverage" charity". profootballtalk.nbcsports.com. NBC Sports. Retrieved December 18, 2014. ^ "COBINHOOD signs NFL'er Richard Sherman to educate people about crypto – Bankless Times". Bankless Times. December 18, 2017. Retrieved September 5, 2018. ^ Swartz, Jon. "Richard Sherman, Like More NFL Stars, Is Playing the Tech Game". Retrieved March 19, 2018. ^ Seahawks' Richard Sherman slides into summer with new pool - Los Angeles Times Retrieved December 12, 2018. Wikimedia Commons has media related to Richard Sherman (American football).